Panasonic has upgraded one of our favourite compact cameras, but does it offer enough to stand above all the smartphone cameras available? With a large sensor, great lens and an EVF, the Panasonic Lumix LX100 II has all the ingredients we’d want from a compact camera, and it even encourages creative photography. While we love the Panasonic Lumix LX100, it dates from 2014, which is a long time ago in camera development terms. So naturally we are delighted that Panasonic has introduced an update, the Lumix LX100 II. And Panasonic has stuck with a winning formula that combines a superb Leica DC Vario-Summilux 24-75mm (equivalent) f1.7-2.8 lens with a multi-aspect Four-Thirds type sensor, in a compact body with an electronic viewfinder. The most significant change brought by the new camera is the sensor. This has been uprated from a 16MP chip in the Mark I to a 21.77MP sensor in the Mark II camera. As before, this sensor works as a multi-aspect device, which means it’s actually larger than is required by any of the available aspect ratios. As a result, the largest images are made up of 17 million pixels, up from 12 million pixels with the original LX100. This adds to its appeal as possibly one of the best travel cameras out there right now for expert photographers. To help photographers make greater use of the sensor’s multi-aspect nature, there’s a switch on the lens barrel that allows you to swap quickly between shooting in 3:2, 16:9, 1:1 and 4:3 ratio. This is a great prompt to consider aspect ratio at the shooting stage rather than when processing images. In fact, it’s beneficial to do so as in Adobe Camera Raw, the RAW files only have the data from the aspect ratio they are captured in. This means any post-capture aspect changes crop into that image. With other cameras’ aspect ratio settings it’s usually possible to see the image from the whole sensor. 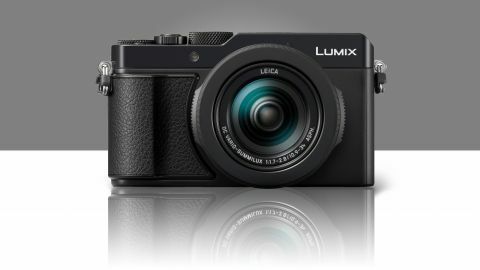 Panasonic has used a very similar, if not the same, body for the LX100 II as it did for the original camera. It has a high-quality feel with metal dials and slim, but effective grips. The traditional exposure controls are also there, with shutter speed and exposure compensation dials on the top plate and an aperture ring on the lens. As well as specific values, the aperture ring and shutter speed dial both have ‘A’ for automatic settings. This means that in addition to manual exposure, you can set the LX100 II to operate in aperture priority, shutter priority and program exposure mode. The sensitivity (ISO) options can be accessed by pressing the up navigation button or the Quick Menu button. There’s also a button on the top plate to activate Intelligent Auto (iAuto) mode should you want it. We found this button prone to being pressed accidentally. The LX100 II gains the Post Focus and Focus Stacking features that merge stills from a 4K movie in-camera. While Panasonic has made the LX100 II’s screen touch-sensitive, it’s disappointing that it’s stuck with a fixed screen. The LX100 II invites you to be creative with your photography, but the fixed screen offers no help when shooting from creative angles. That gripe aside, the screen provides a good view in all but bright sunshine and is responsive to touch. It’s great that both the main and Quick Menus are compatible with touch control. There’s also an electronic viewfinder built in and although at 0.38 inches it may be fairly small, it’s detailed and very useful, and it enables you to focus on the image in a way that a screen can’t. Leica lens means that the Panasonic LX100 II is able to capture images with a high level of detail. This detail is maintained well up to around ISO 3200, although images shot at this value don’t respond especially well to post-capture brightening. In the default settings, the LX100 II also tends to produce pleasant, natural colours. And, if you want to create black and white images, the L. Monochrome and L. Monochrome D Photo Styles do a nice job. In many cases, it’s possible to produce images that are ready for sharing in-camera, so it’s nice to have Bluetooth and Wi-Fi connectivity built in. We found the Auto Transfer system a bit clunky, but it does the job.